If you are an external user and an AODocs library has been shared with you, you can edit existing files and also add files to the AODocs library. – When you add a file to an AODocs library, the file is initially owned by your account. The ownership of the file is then transferred to the storage account of the library. – G suite forbids the transfer of document ownership between different G Suite domains or from a gmail.com account. This means external users can't import their files directly into AODocs. AODocs therefore makes a copy of the files. What happens when you add files or folders as an external user? 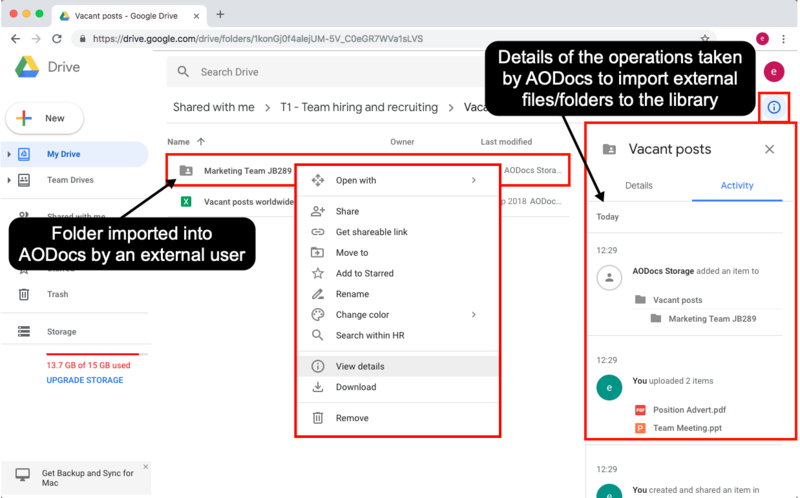 As an external user, the actions available for adding files or folders are slightly different in Google Drive and the AODocs interface. Manage attachments in Document Management libraries. 1. AODocs makes a copy of the source files or folders owned by the external user and adds the copied files to the location in AODocs where the user has chosen to import their files or folders. 2. AODocs tags the source files in Google Drive. You can monitor all these actions in the Activity tab which opens when you press View details in the Google Drive interface.